In this column, you will see a symbol if a field is defined as the Primary key or Foreign key. If the external data table contains a primary key, this will be identified by Intrexx automatically. The primary key of an external data source will be treated as a string field in Intrexx. Title of the data field. Name of the data field. 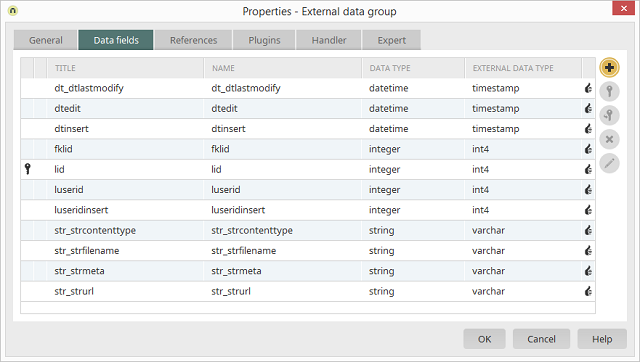 Displays the data type that is used in Intrexx for the currently selected data field. Intrexx recognizes the data type of the external data fields and automatically assigns the appropriate Intrexx data types. Displays the data type that is used in the external data source for the currently selected data field. Opens a dialog where the fields of the external data source can be selected. Defines the currently selected data field as the primary key field. A primary key should always be selected. Make sure that you use data fields with unique values. Defines the currently selected data field as the foreign key field. The field, which is implemented as the foreign key, must contain a value that the parent data records can explicitly be identified with; such as a customer number. Removes the selected data field from the list. If this is still used in the application, an appropriate notification will be shown. The data field will not be removed from the list in this case. Opens a dialog where the title and name of the data field can be modified. External data groups are always labelled with a red symbol. As usual, an external data group's data fields can be shown from the context menu "Show data fields" and connected to edit and view pages.